Nakai, Y. (2016). How do learners make use of a space for self-directed learning? Translating the past, understanding the present, and strategizing for the future. Studies in Self-Access Learning Journal, 7(2), 168-181. 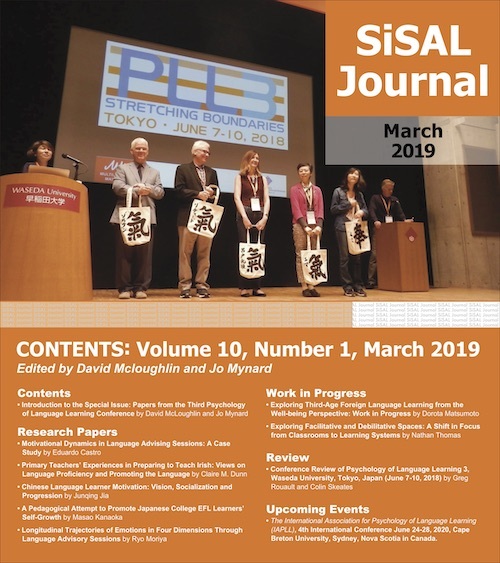 This article aims to reveal how learners make use of a space for self-directed learning to promote collaborative autonomous learning, drawing on data collected at a Japanese language institution for the Economic Partnership Agreement (EPA) care worker candidates in Osaka. The data analysis shows that, through the activities the learners chose and organized, they imagined an ideal L2 self and created their own L2 world. As soon as the self-directed learning session had started, they created their own group on Facebook and promoted learning activities which were related with their real lives in Japan. These activities on Facebook created a learning space beyond the classroom. These online activities they engaged in eventually returned to the classroom space and led to them increasingly taking ownership of the physical space. This research reveals that an important factor for self-directed learning is providing learners spaces and allowing them to explore the boundaries and possibilities of that space. The learners in this case study used the space to translate their past experiences and present emotions into the second language context, and moreover, to strategize for the future. To encourage collaborative autonomous learning, the activities must be organized around learners’ inner worlds where their emotions, experiences and futures exist. This study shows how collaborative self-directed learning sessions within a language training course enabled a group of learners of Japanese as a Second Language (JSL) to construct spaces through which they could connect their language learning with their past, present and future selves. The language training was organized for candidates from the Philippines who were aiming to become care workers in Japan under the Economic Partnership Agreement (EPA), which was established in 2009. The EPA training program begins in the Philippines, where candidates are chosen in response to the demand of Japanese host nursing homes. While still in the Philippines, they undertake Japanese language training for three months. Then they come to Japan and take six further months of language training. After finishing language training, they are sent to nursing homes for three years of practical training before they finally take the national exam for care workers. I conducted this research at a Japanese language training center in Osaka, Japan where I worked with trainees as a language teacher. At this training center, Japanese language lessons and lectures on Japanese culture are provided from Monday to Saturday, for approximately six hours a day. The aim of this training program is to develop the students’ Japanese language skills necessary to work as care workers and integrate into the wider Japanese community. Moreover, a further aim of the training institution is to develop their learner autonomy which enables them to manage and keep learning with no language teachers after finishing language training. Language classes are organized according to each candidate’s Japanese language proficiency and conducted by a team of teachers. Candidates learn Japanese from elementary to intermediate levels, as well as technical Japanese used in the context of care giving. In addition to these lessons, the institution provides an extra one-hour session, called ‘self-directed learning session’ in this center. In this session, learners organized their learning activities in a classroom so that they can promote their autonomous learning, with the ultimate goal of adapting to the changes in their learning environment and to the demands of technical training in a nursing home. This session is provided on an irregular basis as shown in table 1. In this article, I will focus on these self-directed learning sessions and elaborate on how learners promoted their self-directed learning by exercising their learner autonomy. From the perspective of ecology, learners are living organisms who interact with the environment and this interaction encourages development (van Lier, 2002). Language learning is co-constructed between groups of individuals and their environment, and development in learning is mediated by activity (Kramsch, 2002). Applying these perspectives to a classroom in which the resources are far fewer than one might find in a self-access center, it can be argued that learning together and the interaction this entails can be considered as language learning resources. In terms of promoting collaborative learning, the Zone of Proximal Development (ZPD) and the Zone of Proximal Adjustment (ZPA) are the key ideas to be considered. ZPD is defined by Vygotsky (1978) as “the distance between the actual developmental level as determined by independent problem solving and the level of potential development as determined through problem solving under adult guidance, or in collaboration with more capable peers” (Vygotsky, 1978, p. 86). Murphey (1996) defines ZPA as teachers’ and learners’ variable abilities to adapt or adjust to partners and situations. He states, “Both teachers and students may be learning new ways to adjust, or how to adjust for the particular learner they are with, or learning that some ways are not working well, all of which also adds to their repertoire of adjusting capabilities with future students, thus expanding their ZPA” (Murphey, 2013, p. 178). ZPD and ZPA are not separate but co-constructing because they are interactive and influence each other. Likewise, interacting with other learners and teachers through activities in collaborative learning leads to learning as students access the ZPD and expanding ZPA with their peer’s assistance. Benson (2011, p. 47) states that learner autonomy is “the capacity to take control of one’s own learning” and discusses the three dimensions of control a learner can exercise: learning management, cognitive processes and learning content. From a sociocultural perspective, learner autonomy is a social agency oriented to a social interactive context in which learners interact with and help each other (Toohey & Norton, 2003), and develops through interaction between learners and more capable others (Little, 2000). Thus, peer assistance and learner autonomy are interdependent elements in collaborative learning where learners can develop the capacity to take control over language management, the cognitive processes utilized in the ZPD and ZPA as mentioned, and learning content. When it comes to learning content, Palfreyman (2014) states that learner autonomy is a capacity for intentional use of a range of interactive resources (which can be material, social, or discursive) toward learning goals. The learner will identify resources relevant to their purposes and the development of their autonomy proceeds as they develop an awareness of these resources and their use of them. As learners exercise their control over the learning content, they make adjustments and discover new ways of using content and materials within the ZPA by learning with other learners. Moreover, Murray, Fujishima, and Uzuka (2014) discuss the relationship between learner autonomy and space which influences language learning as a dimension of learner autonomy. They assert that autonomy and place are social constructions, emerging from the interplay of action and discourse in a specific space. Learner autonomy is not having control over one’s learning space, but having the possibility to exercise one’s agency within the space. This spatial dimension of learner autonomy needs to be considered when attempting to foster learner autonomy in collaborative learning. Based on the above literature, I theorized the self-directed sessions as a collaborative and autonomous space for learning. I facilitated these sessions focusing on the promotion of learner autonomy by introducing collaborative learning in self-directed sessions by using exploratory practice. Exploratory practice (Allwright, 2003), which is based on ecological perspective, develops our understanding of learning and teaching environments of classrooms through shining light on our ‘puzzles’ about classroom events. Allwright (2003) defines what happens in classrooms as not problems but puzzles in order to avoid the negative connotations of problem. Candidates and I worked together as practitioners in a classroom to discover autonomous learners’ needs as our puzzles. This practice provides us with a better understanding of autonomous learning in which both of learners and teachers can develop, but it possibly seems likely to induce complacency due to understandings based not on prior research but on practitioners’ perceptions. 35 self-directed learning sessions were conducted in the same classroom where learners took language classes during a six-month course from weeks three to 12, and from weeks 16 to 22. The classroom was equipped with desks, chairs, a whiteboard, one PC and wireless internet connection. Learners brought their own textbooks and smartphones and tablets as a learning resource. When the sessions started, I explained to the learners why they were important, and how the sessions would be conducted. In these sessions, I asked learners to carry out their learning according to the three steps based on Little (1991)’s identification of learner autonomy. They are 1) planning for learning and splitting a class into small groups, 2) learning in groups, and 3) reflection and reporting. At the beginning of the session, learners shared their own ideas of what to learn and made groups. After pursuing these ideas for learning in groups, they shared their reflections on what they did and how it went. During these sessions, I gave advice only when they had difficulties in planning or conducting their learning activities. For example, I advised them by offering some example ideas about what they could do with their classmates in the classroom, and answered their questions regarding linguistic issues such as grammar and vocabulary. To what extent were the students comfortable with exercising their autonomy? What kinds of activity did the students choose to engage in during the sessions? What can the kinds of activities they chose tell us about the needs of students as holistic individuals? When I began collecting data, the students in the language class were at an upper elementary level. The class consisted of 10 female candidates who had finished elementary level Japanese language training in the Philippines before coming to Japan. They were between 23 and 31 years old. I collected data during twelve sessions from June 12th to October 27th in 2012. I observed and took notes on the learners’ activities and audio-recorded what they said in Japanese during their time for reflection. I transcribed the audio data and translated them into English (shown as quotations below). I also used a teacher logbook in which the other teachers recorded how the sessions went in order to confirm what they actually did in the sessions for data analysis. I analyzed the data by using case study methodology (Merriam, 1998) to examine how learners promoted and developed their learning in the sessions. Case study is characterized by ‘the goal of eliciting understanding and meaning, the researcher as primary instrument of data collection and analysis, the use of fieldwork, an inductive orientation to analysis, and findings that are richly descriptive’ (Merriam, 1998, p. 11). Through analysis, I focused on the process of their development of learning, how and why they chose the way of learning, and how they reflected their learning. These responses show that learners either wanted the teacher to conduct the lesson, or for the teacher to let them go and study completely freely. Even though they complained in the beginning, as my analysis will show, their attitude toward the affordances—“a particular property of the environment that is relevant to an activity” (van Lier, 2000, p. 252)—of this autonomous learning space changed gradually as the sessions went on. From these answers it can be seen that they had decided to use the self-directed time and space to focus on the Japanese language itself, the acquisition of which was necessary in order for them to achieve their shared future goal of becoming care workers in Japan. However, at the same time, one of them made a private group page on Facebook so that they could learn Japanese enjoyably by sharing their interests within the group. They posted some questions and riddles they made in Japanese, focusing on vocabulary with discussion questions such as “What is your most treasured possession?” They engaged in these kinds of activities in the classroom and on Facebook as well. We can see how the learners took advantage of an online social network site to extend the boundaries of the self-directed learning space. Here we can see how the learners projected themselves and their experiences into the characters of the movie, integrating real life with a fictional story. One learner posted it on the group’s Facebook page as well. After this, another learner posted some Japanese pop music lyrics on the group page. For example, one of the lyrics she posted was from Mikazuki, a song by the Japanese artist Ayaka, in which she sings about both the sadness of being separated from a lover and the solace and strength she takes from knowing they are looking at the same moon. When I interviewed her about why she had posted the lyrics she said that the lyrics really spoke to her and her feelings as her partner was living in the Philippines at that time. This served as a starting point for the students posting lyrics from Japanese pop music and commenting on Facebook. At the same time, they started listening to the music they had posted, translating the lyrics, and singing it together in the sessions. Just as the drama activity had allowed some students to ‘translate’ pivotal moments from their lives and the ensuing emotions into Japanese, the online and classroom activities they chose to carry out related to pop music also created a space in which they could translate their emotional experiences into the second language and their new lives. Around week nine the students started manifesting their classroom network online by posting their pictures taken with their classmates on Facebook and leaving comments about their good relationships with them. I observed the students decorating the classroom walls with cards on which they had written Japanese words. They also made a confectionery corner by using a shelf in the classroom to store sweets and other snacks. I took this as a sign that the students had, perhaps through the above activities, finally begun to feel comfortable in the learning space. Indeed, by decorating the walls and leaving their belongings, it could be said that they had taken ownership of the space. Lastly, they organized a role playing activity in the classroom, which was based on three situations they had experienced in the Philippines. Situation 1: An insomniac care recipient asked a care worker to stay and chat with him. Situation 2: A care recipient in a wheel chair wants a care worker to take out him for a walk. Situation 3: A care recipient with dementia complains about his domestic relations. During the reflection task, they explained the motivations behind choosing to do these professional role plays. They practiced conversation through the role plays, imagining themselves working in nursing homes. On Facebook, some activities were also conducted in the same way. They posted some situations involving care giving in their imagined near futures, and practiced conversations face to face in the classroom as learning activities. In these activities, they used the space to draw on past specialist experiences, translating expertise and experiences into L2, while also looking to the future and to reposition themselves, not just as trainee care-workers, but as specialists with expertise in the field. Using Facebook had a great impact on their learning. The Facebook group facilitated a shift from institutional-initiated communication to the personal realm and offered what Gardner (1991) referred to as an ‘entry point’ that helps learners to engage in learning (Chik & Breidbach, 2014). In this research, Facebook, which was a familiar social media site among the candidates, allowed them to extend the boundaries of the learning space and connect the language learning to their real lives outside of the classroom. In particular, Facebook can be seen to offer ‘entry points’, and it in turn fostered learner autonomy leading to autonomous activity within and beyond the classroom (Nakai, 2012). Facebook led to the learners engaging with the learning process by offering space and support for learning activities where learners connect with their surrounding context and where their goals are shaped by the discourse in their context. Through the sessions, the learners organized activities that evoked their emotions related to their experiences, both lived and imagined in the future. Through acting in a drama, the learners underwent a transformation where they stepped out of the classroom into an imaginary setting (Stern, 1980). The learners could express their own voices in a second language by overlaying their experiences on characters in the story. Japanese pop music connected language learning to the learners’ inner world in the same way as the story-making activity. Through lyrics that resonated with their feelings, they learned language by using it to express their emotions. These autonomous activities accordingly let them speak their own real words in their target language. Furthermore, during the activities in which they discussed their networks and created professional role plays, they imagined an ideal L2 self (Dörnyei, 2005) as a caregiver working in Japan, and brought their real experiences and lives in L2 into the classroom. Ideal self represents the person one would like to become and is one of the possible selves people use to conceptualize their as-yet unrealized potential and act as future self-guides (Dörnyei, 2009, p. 11), which motivates learners to learn language so that they can be the person they want to become. This ideal self, embodied in their activities, led to their autonomous learning. Students’ learning was mediated and generated by activities helping them learn as language users within a present and future social community of care giving in Japan. As Palfreyman (2014) claims, candidates indeed sought out resources from their context related to their real life and adapted them for learning voluntarily. They exercised learner autonomy by developing awareness of the possible resources surrounding them through interacting with classmates. As for a space, the analysis shows learners claimed ownership of space for learning by exercising their agency within the classroom. This means, as Murray et al. (2014) state, that they exercised their learner autonomy through activities in the classroom as space for learning. In short, the cases of activities discussed above represent the progress of their development through activities in which learners situated themselves in their L2 context by exercising learner autonomy to take control over the learning resources and space. After some initial trepidation, the students gradually began activities in which they exercised their collective autonomy to collaboratively organize activities within the self-directed learning space. I observed that they were actually using these activities to create sub-spaces through which they were able to craft links between their new language and their lived experiences. Through these spaces, the learners created opportunities for them to translate and reconstruct aspects of their past, present and future selves into Japanese. How can a teacher facilitate autonomous collaborative learning? It is crucial for the teacher to help learners find the path from their L2 world to their real life by exploring the boundaries and possibilities of a space for learning, using the space to translate their experiences and emotions into the second language context and strategizing for the future. This is an opportunity for learners to determine the direction of learning which framework their methods and techniques to promote learning. The connection of the L2 with their real world produces a commitment to learn and fosters their learner autonomy. Yoshio Nakai is an assistant professor at Doshisha University and has taught Japanese for more than 10 years. For his PhD research, he analyzed learners’ motivation using a modified grounded theory approach. He promotes and researches collaborative learning in his teaching in order to help learners to be more autonomous. Benson, P. (2011). Teaching and researching autonomy in language learning (2nd ed.). Harlow, UK: Longman. Chik, A., & Breidbach, S. (2014). ‘Facebook Me’ within a global community of learners of English: Technologizing learner autonomy. In G. Murray (Ed. ), Social dimensions of autonomy in language learning (pp. 100- 118). New York, NY: Palgrave Macmilan. Dörnyei, Z. (2005). The psychology of the language learner. Hillsdale, NJ: Lawrence Erlbaum Associates. Gardner, H. (1991). The unschooled mind: How children think and how schools should teach. New York, NY: Basic Books. Little, D. (2000). Learner autonomy and human interdependence: some theoretical and practical consequences of a social-interactive view of cognition, learning and language. In B. Sinclair, I. McGrath & T. Lamb (Eds. ), Learner autonomy, teacher autonomy: Future directions (pp.15-23). Harlow, UK: Longman. Merriam, S. B. (1998). Qualitative research and case study applications in education. New York, NY: John Wiley & Sons. Murphey, T. (1996, September). Proactive adjusting to the zone of proximal development: Learner and teacher strategies. Paper presented at the 2nd Conference for Socio-Cultural Research Vygotsky and Piaget; Geneva, Switzerland: September 1996, Psychological Sciences Research Institute: Geneva, Switzerland. Murray, G., Fujishima, N., & Uzuka, M. (2014). The semiotics of place: Autonomy and space. In G. Murray (Ed. ), Social dimensions of learner autonomy in language learning (pp. 81-99). Basingstoke, UK: Palgrave Macmillan. Nakai, Y. (2013). How do learners change their attitude towards learning through collaborative learning? : A report from a Japanese as a second language classroom. ILAC Selections 5th Independent Learning Association Conference 2012 Edited, 62-64. Palfreyman, D. M. (2014). The ecology of learner autonomy. In G. Murray (Ed), Social dimensions of autonomy in language learning (pp. 175- 191). New York, NY: Palgrave Macmilan. Stern, S. (1980). Drama in second language learning from a psycholinguistic perspective. Language Learning, 30(1), 77-100. Toohey, K., & Norton, B. (2003). Autonomy as learner agency in sociocultural settings. In D. Palfreyman & R. Smith (Eds.) Learner autonomy across cultures (pp. 58-72). London, UK: Palgrave, Macmillan. van Lier, L. (2002). An ecological-semiotic perspective on language and linguistics. In C. Kramsch (Ed. ), Language acquisition and language socialization (pp. 140- 164). London, UK: Continuum.